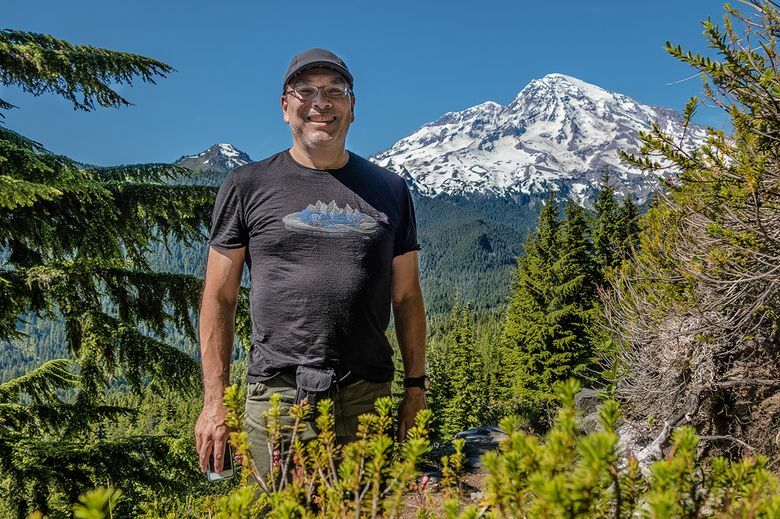 Author Glenn Nelson poses for a photo in Mount Rainier National Park. Many people of color live in Seattle neighborhoods like Rainier Valley and Rainier Vista, yet few have ever been to the national park with the same name. WHILE handing out fliers as a volunteer for the 99th birthday of the National Park Service, I conducted a highly unscientific survey at Mount Rainier: I counted the number of cars that contained at least one person of color. This was a fee-free day to access the national park, so the variable of finances largely was taken off the table. As a Japanese-American journalist, I have lived with race all my life, so this wasn’t difficult. I conservatively estimate 400 cars passed through the Nisqually entrance during a four-hour shift. Fifteen percent contained Asian Americans and 1.25 percent contained African Americans, the same for Latinos. I recognized no Native Americans, who for centuries have regarded “Tahoma” with reverence. The rangers at the entry booths said the day’s demographics were consistent with their usual experience. An African-American author, Cheatham still can’t fire up his fertile imagination and envision himself and his peers in a national park. He doesn’t even know what to expect. “As far as I know, it’s a big field of grass,” he said. The locals mirror the dismal demographics of the National Park Service, which says it wants its centennial on Aug. 25, 2016, to provoke movement on diversity and inclusion. The agency is enjoying unprecedented popularity. It drew a record 293 million visitors last year, but the vast majority were white and aging. The numbers portend disaster for our public lands. The Census Bureau projects a nonwhite majority in the U.S. within the next three decades. If that new majority doesn’t develop any affinity for the outdoors, the Park Service, as well as the retail and nonprofit ecosystem surrounding it, could go the way of pay phones, records and film cameras — from indispensable to irrelevant. This is not progress; it is regress. Some would not choose the Park Service to remedy the nature-deficient disorder that clings to communities of color. Government agencies are inherently inefficient, they argue, and many private organizations are trying to make a dent, mostly working with youth. However, private efforts can be fleeting and incomplete, and ultimately don’t scale. The Park Service has instantly recognizable landscapes, the reach of the federal government and its centennial as a platform. But if the Park Service is the face of outdoors in our country, it can’t be so unrelentingly white. Eighty percent of agency employees were white in 2014, matching the percentage of its white visitors. Factor in the overwhelmingly Caucasian nature of conservation and environmental organizations, as well as the near-complete absence of minorities in media and advertisements, and it’s no wonder that people of color view the outdoors as an exclusive, whites-only club. Make no mistake, diversity in the outdoors is a white issue. People of color aren’t exactly demanding access to the backcountry; this ain’t the civil rights movement. If the white-dominated infrastructure of the outdoors doesn’t make a successful play at wooing wildly growing nonwhite communities, it risks handing off its future and legacies, not to mention the health of the planet, to massive uncertainty. Putting on a friendlier, less-white face and making a point of inviting in people of color is the only way to start changing the perception of exclusion. The rest of the outdoors space must step up to support a resource-strapped agency that last year had to defer $11.5 billion in basic maintenance. Discussion of any other parlor tricks or flashy marketing moves is immaterial until those first steps are taken. Otherwise, when I’m taking racial attendance next year at our closest, most iconic landmark, I’ll doubtless be counting up an utterly colorless centennial for the National Park Service.